Do you enjoy reading, writing, and education? Are you looking to become a volunteer adult tutor? Do you want to learn about creative ways to integrate literacy into your home, family life, or community? Are you interested in improving your reading, writing, numeracy, or computer skills? If so, this session will be of interest to you. Literacy is said to be the foundation of all learning. An adult’s individual literacy level impacts their success in all areas of life, including home, work, and community. 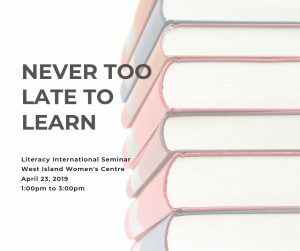 During this session we will learn more about the importance of adult literacy and how it impacts our daily lives. We will explore creative and interesting ways to incorporate reading and writing into everyday life. We will also provide information about our free one-on-one adult tutoring program, our library and resource centre, and how to get involved as a volunteer adult tutor. Participants will be entered into a draw to win a $10 Chapters gift card. Our presenter, Tracey Walsh, is the Outreach & Community Programming Coordinator at Literacy Unlimited. Literacy Unlimited is a non-profit community-based organization dedicated to changing lives through improved adult literacy.